It was the week of Halloween. Elliott wants to play fighting goblins with his brother, but Michael is not interested. So when Elliott hears a strange noise outside, he decides to do his own goblin hunting solo. Following some very odd footprints, clearly not made by a coyote, he comes upon a creature that looks like a goblin. It's definitely not a coyote! Elliot thinks. But Michael and Mom put Elliott's description down to a pre-Halloween imagination. Still, the next day Elliott spots some strangers with odd equipment searching in the woods nearby, and he guesses that they are looking for that goblin he saw. Elliot had to find the goblin first! So Elliott leaves a strategic trail of candies from the edge of the woods to their shed and to his room. And the goblin shows at in his house. He looks friendly, so Elliott introduces him to Michael and his sister Gertie. Michael is instantly intrigued, but Gertie has one objection. "I don't like his feet!" Still the kids believe that their strange three-toed visitor is a stranded alien, and they all pitch in to help him get home. They show the visitor where they are on Michael's globe, and when the extra-terrestrial spots their phone, he knows what he must do to find his way home. Luckily, it is soon Halloween, when their alien looks like just another trick-or-treater, and the costumed kids help their new friend find his way back home with the help of their suddenly airborne bikes, in a picture book adaptation of the 1982 classic film, E.T. the Extra-Terrestrial: The Classic Illustrated Storybook (Pop Classics) (Quirk Books, 2017). 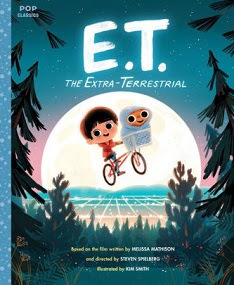 For youngsters who have not seen the famous film, this version, illustrated in simple cartoon style by Kim Smith, is not a substitute, but a good introduction of the movie, stressing the kindness of the kids and E.T., the not-so-scary alien invader. With its theme of the kindness of strangers, this story is a great one to open the emotions and imagination of young readers. For more about this film classic, share this on with E.T. The Extra-Terrestrial from Concept to Classic: The Illustrated Story of the Film and the Filmmakers, 30th Anniversary Edition (Pictorial Moviebook).